Choosing software to run an online shop is not that easy. There are hundreds of different ways you can set up your Internet store and it can be very confusing for business owners. If you are a big corporate organisation, though, you probably have a large team of programmers and experts who can spend time sifting through the possible solutions, or even writing a bespoke program to suit the business. But if you run a smaller business, that’s not an option. In this situation you are either left with asking an agency to provide a solution or trying to sort it out for yourself. And then the problems begin. If you use an agency, they will probably use the system they are familiar with – their favourite. That might be good for your company, but it might have limitations for your specific kind of business. So, to be sure you get the right solution for your firm you may well need to select the software yourself. And that means you need to sort through those hundreds of options which usually means nothing happens…! When humans are faced with complex choices they usually decide not to decide. They walk away from the problem because it is too difficult to solve. What this means is that there are probably millions of businesses who want to run an online store, but having been faced with the complex array of choices have given up and decided to wait until it all becomes simpler. Some hope. Software that you download and install onto your own web server and run for yourself. Let’s take a look at these three options. The agency option may be suitable for some companies, but you will be limited to their choices and you will have to pay administration fees – even if they use open source software. As a result this can be a costly option. If you use a hosted service, such as the various online shop systems available, you are limited to their designs and you have to pay monthly fees. For a shop that does everything you need, this can be more than $150 per month. The third option, downloading software and managing it yourself, can often be completely free of charge – but you have to provide the hosting and spend time running the system. Essentially you need to choose between the amount of freedom and control you want. If you want the utmost freedom and control over your online shop, you need to download software and run it yourself. If you do not need complete control, then an online hosted solution is fine. If you are not bothered about controlling your set-up in any way and are simply happy to have anything online and free yourself of all the operational side of that, an agency is the best idea. The first step in choosing your shop system is to work out the amount of control you need and then select a system on that basis. For many business owners, remaining in control is essential. That means they need to download and host the software themselves. That is the second stage of selection. Many hosting companies have installers available for a wide range of e-commerce solutions. You are just one click away from setting up shop. But which of these self-hosted programs should you select? Again, you need to make the choice as simple as possible, otherwise you will walk away from the decision. A hosting company like GoDaddy, for instance, offers you 9 different programs, in addition to its own hosted shop software. How do you choose between 9 programs – especially when many of them offer the same functions? Have I heard of this program before? Does it look and feel “right”? These questions help narrow down the selection because the tap into some core psychology in decision making – emotions and the avoidance of any kind of threat. When humans make decisions they are trying to protect themselves and avoid having to “fight or flight”. We do that using systems that check whether what we are facing is some kind of “stranger” or whether it is “fresh”. If the program is not used by many people, if you haven’t heard of the name, it is more of a stranger – and psychologically therefore more of a threat. And if the program hasn’t been updated in a while, it is viewed as old and stale by our brains and that is also a “threat” to us; human beings prefer fresh and new things. By asking yourself these three questions you can pinpoint software that is your starting point for selection. The chances are you will come down to two or three potential programs to choose from. These are all used by hundreds of thousands of businesses and any cursory search for software to run your online shop is bound to come up with these three programs. So, they fulfil the “not being a stranger” requirement. Also, they are all updated on a regular basis, meaning they are “fresh” and they are therefore less likely to be a psychological threat as a result of being old and outdated. Which means that all we are left with deciding about these three is “do they feel right?” That is subjective and is based upon your personality, the way you like working and your “gut instinct”. Essentially this means you need to install each of these programs and “have a play” with them and find out which you prefer. An important factor about online shop solutions is this: if you do not like the one you select you will use it less often, you will find it a chore. If that is the case, your online shop will not be as successful as you might hope. Therefore, it is important that you select the one you like the most – the one that appeals to you on a subjective basis. Having said that, there are some important considerations when it comes to choosing your online shop solution. The program has to do what you need it to do and it has to do that in ways which are going to be cost-effective and not time-hungry. After going through this selection process I came up with my seven reasons for finally selecting PrestaShop. It passes those psychological tests of freshness and not being a stranger. It is used by more than 185,000 online shops and has been downloaded almost four million times. Plus the software is in constant development, with hundreds of updates happening each month thanks to a community of developers. So, the only question was “does it feel right?” When you load the program it looks and feels professional, it operates well and it certainly does the job. It all looks good and feels as though it can do the job. For me, it passed the “feel” test easily. Which means the next part of the decision-making jig-saw was to decide, finally, could it do what I needed it to do. I set up a simple PrestaShop store and discovered these seven reasons as to why it beats the competition. The one thing a shop owner wants to do is to get products uploaded and being sold. The process by which PrestaShop enables you to get your first product selling is straightforward. Everything you need is all in one place – the “Catalog”. This means that even if you do nothing else, you can start selling within minutes. Compared with other software I found this a much easier process on PrestaShop. One of the biggest problems for people outside the USA – where much of the software is developed – is setting up taxes. I am based in the UK and I am a VAT Registered trader. Hence I need to be able to charge that Value Added Tax to my customers in Europe. However, as anyone in Europe who charges VAT will know, it is not an easy tax system to administer. For instance, even though you may be a VAT registered trader not everything you sell will be taxable. Not only that, if it is taxable it can be taxed at one of several different rates. On top of this, if you sell within Europe to someone who is also a VAT registered trader they can have the tax deducted before payment. There are very few programs which understand this complexity. With PrestaShop, setting up taxes is easy. You use the preferences to say which country you are in. Then you simply select the taxes which you want to operate. For EU taxes all you then need to do is enable the “European VAT Number” module and everything works as it should do. This is the simplest system of setting up taxes I have seen. Many online stores these days need to sell digital products. So, whether or not your shop can easily set up digital products is an important consideration. Even if you currently do not sell anything digital, there may be the need in the future. For instance, a fashion store might one day want to make a fashion radio show downloadable, or an ebook on choosing the right clothes for a holiday. It means that you cannot rule out digital downloads, even if you don’t use them at the moment. Thankfully, PrestaShop makes digital downloadable products easy to set up. With the product creation settings all you need to do is choose “Virtual Product”, upload your digital file and the program does the rest. This is a straightforward approach and one that is “common sense”, whereas the competing programs tended to make it more complicated for me, at least. PrestaShop works through the addition of “modules”. The base install of the program adds all the essential ones, but there is a massive community of developers all coming up with extra ones. For instance, there are 57 different modules for payment gateways, meaning you can add a whole variety of payment methods for customers. Want to incorporate social media within your shop? There are almost 200 modules that let you do that. Plus there is a whole host of administrative modules to help you ensure greater profitability, such as the module that tracks conversions from Google AdWords. Many of the modules are free of charge, others mostly have a small one-off charge and a few are so specific they can be costly. Even so, the module system means you can modify and expand PrestaShop to provide exactly the kind of online shopping system your business needs. Other online shopping software does allow you to do this, but not with the ease of PrestaShop. One of the most important aspects of running a shop is ensuring you understand your customers. As a result, managing your customers is essential. Being able to see what kind of things they are interested in, when they buy, how often they buy and so on, is vital to ensuring you can target them with more suitable things. 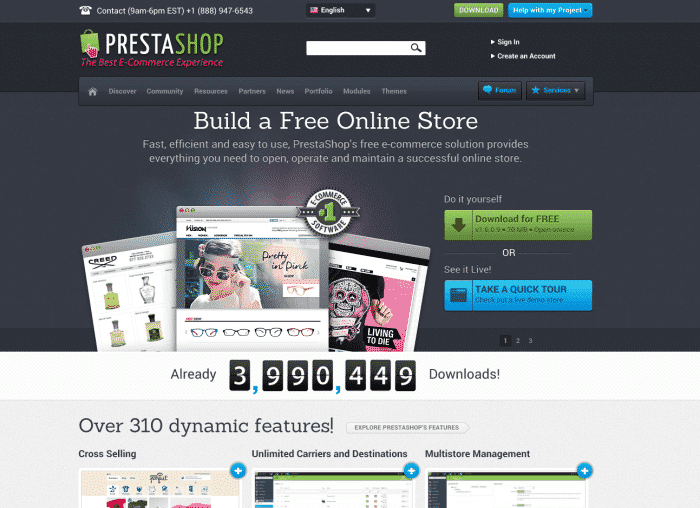 The customer management system of PrestaShop gives you a snapshot of each of your customers. Just click on their name and you have a complete page of information about that individual. Competing software does provide customer management, but not in such an easily digestible snapshot. Instead, you tend to have to click through several pages or open up sections of a page. PrestaShop’s customer management system is so much easier for me. Most online shops are “alive”; they have new products added each day, as well as additional information, reviews, new pictures and so on. When you make any changes on PrestaShop these are changed immediately on the “live shop”, unless you are working in “maintenance” mode. The problem with some online e-commerce systems is that any changes you make are not reflected in the live site until you push them out to the web, or unless you refresh your system’s cache. What this means in practice is that it is too easy to make changes which then are not reflected in your live site. With PrestaShop, your changes are made straight away, unless you decide not to allow those changes to happen by switching on “maintenance”. What this means is that PrestaShop is the right way round, from my psychological perspective. It means I can make a change and it happens on my live shop without me having to think about it…! One of the rather nifty and easy-to-use feature of PrestaShop is being able to customise things for individual buyers. For instance, not every shop is going to be selling to consumers. One of the errors made by other software providers is that they appear to assume that all selling is “business to consumer” (B2C) but there is more “business to business” (B2B) activity online than B2C. PrestaShop allows you to switch on its B2B options which means you can invoice people, instead of them having to pay online, for example. But the level of customisation goes deeper than this. Using the “Cart rules” for instance you can provide pricing per customer – that’s important in the B2B sector. But you can also use this as a B2C shop to provide loyalty discounts, for example. What PrestaShop allows you to do is to easily set up a system that is as individual as your customers. But what are the problems with PrestaShop? Even though there are seven good reasons for considering PrestaShop, it does have its downsides. One of these is getting inside the head of the developers…! They use different words to the rest of us….! For instance, instead of allowing you to “design your web pages” they require you to do “theme configuration” and “module positioning”. True, it is possible to do this on an overview of your web page, but the design of pages using PrestaShop is not as easy as it might be, at least not until you get used to the system. What this means is there is a bit of learning to do. Frankly, all the online shopping systems are much the same – they focus on function from a software engineering perspective. They have a long way to go in terms of being “user friendly”. So, with PrestaShop, as with the other programs like it, you need to set aside some time to learn the basics and get used to the language. It only takes a couple of hours, but you do need to do it. Another issue with PrestaShop is that there are some “loose ends” which clearly need to be tidied-up. For instance, when you are on the “modules” page and you want to enable a module it does so, but does not take you back to the page you were on, but only back to that module. This means that if you want to enable several payment processing modules, for example, you have to go back and forth between the pages. It is a mild frustration, but little niggles like this can annoy you…! If you have decided that you need control by running software yourself, then PrestaShop could well be the right choice for you. Minor issues aside, it does have several good reasons in its favour. Overall, it was for me the easiest system to set up and use and had the greatest range of features that could be organised with the least amount of effort. For businesses that have complex tax arrangements, which operate in the B2B sector and need to offer digital products it is way ahead of the alternatives. But for what you might call an “ordinary” online B2C store owner, it is also excellent because of its “out of the box” simplicity.